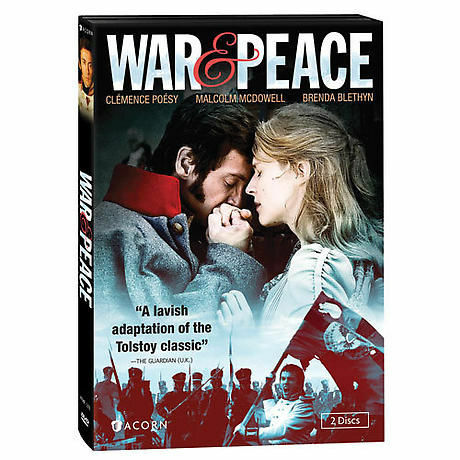 Coproduced by six countries, featuring an international cast and filmed partly in imperial palaces in St. Petersburg, this extravagant miniseries is the newest adaptation of Leo Tolstoy's great novel. The story of four aristocratic families in Russia during the Napoleonic era stars Clemence Poesy (Harry Potter and the Goblet of Fire) as beautiful Natasha Rostova and Alessio Boni (Caravaggio) as handsome Prince Bolkonsky, with Malcolm McDowell and Brenda Blethyn in standout supporting roles. Seen on European television in 2007. 4 episodes, 7 hrs, 2 DVDs, SDH.